Chinese studio Neri&Hu has created a versatile, spherical glass lamp for Italian lighting brand Artemide that can be used as a table lamp or suspended as a wall lamp. The nh1217, which Artemide describes as "an elegant yet practical appliance", was designed by the Shanghai-based firm to evoke traditional Chinese lanterns. 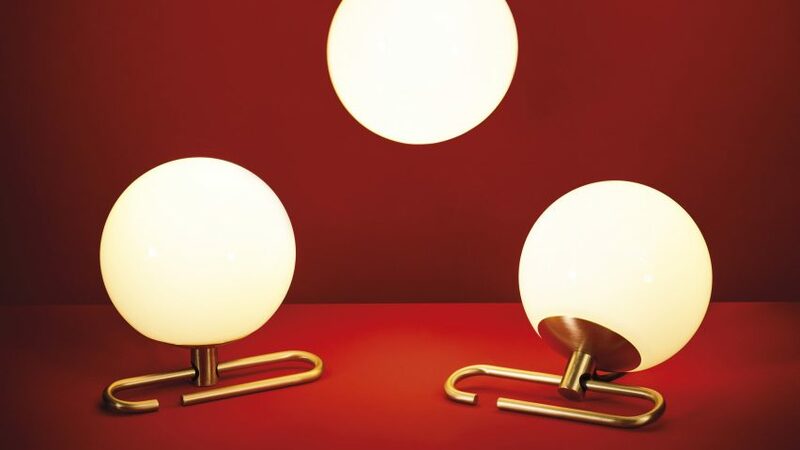 The lamp's spherical white blown-glass diffuser slides along a brushed brass ring, which can be used to prop the lamp up on a surface, or used as a hook to mount on a wall. The diffuser can be freely adjusted to direct the light according to the lamp's position. The lamps continue a collaboration between Neri&Hu and Artemide, which began earlier this year with the launch of the Yanzi collection at Milan Design Week. "Nh1217 continues research on the dynamic interaction of experience, details, materials, form, and light," said the Italian brand. "The selected materials represent a perfect combination of tradition and innovation, as well as the expression of responsible and sustainable design, also conveyed by the use of an in-box low-consumption retrofit LED source and by the eco-friendly cardboard packaging." Chinese-born, Harvard-educated couple Lyndon Neri and Rossana Hu established their Shanghai-based practice Neri&Hu Design and Research Office in 2002. The popularity of the studio's richly textured interiors, which are always a hit with Dezeen readers, secured them a spot at number 71 on the Dezeen Hot List. Some of their most popular projects include skincare shop in Seoul divided up by a lattice of brass rods, a boutique for fashion brand Comme Moi, a 1950s-inspired burger restaurant and a space for London department store Selfridges. Photography is by Pierpaolo Ferrari.